Editor’s note: Once a month, this column will tackle broader questions about what the country should do to increase educational opportunities for black youths. Studying the successes of black female mathematicians opens a window into how we can produce more black STEM (science, technology, engineering and math) grads. It also exposes the bigotry that prevents us from doing so. 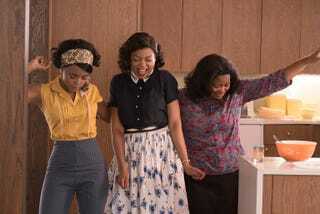 The new movie Hidden Figures, based on the book of the same title by Margot Lee Shetterly, tells the story of Katherine Johnson (played by Taraji P. Henson), Dorothy Vaughan (Octavia Spencer) and Mary Jackson (Janelle Monáe). These black women represented dozens, if not hundreds, of black female “computers” whose largely unrecognized intellectual contributions after World War II gave rise to the U.S. space program. The lesson? The U.S. will continue to cut off its nose to spite its face by not treating the advancement of black girls’ achievement like the space race. When victory is in the balance of war, it’s easier to see why a country must reap the talents of all its citizens—including black women—to protect everyone from existential threats. World War II made clear to the military the advantages of recruiting across racial lines. Later, the country’s collective talents led to the launch of astronaut John Glenn into orbit in 1962, along with the science that went along. Unfortunately, the participation of black women in the sciences has not rocketed. But none of those college graduates in 1940 became engineers. Today, about 24 percent of black women over the age of 25 have earned at least a bachelor’s degree, compared with 20 percent of black men in 2014. For the 2012-2013 academic year, 65 percent of bachelor’s degrees earned by black students were awarded to black women. However, just 2 percent of black women worked as scientists or engineers in 2010, according to the National Science Foundation. When NASA, or the National Aeronautics and Space Administration (formerly known as the National Advisory Committee for Aeronautics), appealed to black female mathematicians during the Jim Crow segregation era, it showed how desperate the country was to strengthen its military and win the space race. It also confirmed that black women do math as well as any other group. When given the opportunity, black women can launch a man into outer space or create war machines. Today we’re not desperate to find cures for diseases, new forms of mass transit, better renewable-energy sources and protections for our eroding wetlands. And the country suffers for it. We’re more interested in raising test scores and “gap closing” than in pushing black and brown minds to solve tangible problems. But we shouldn’t have to go to war to give black and brown youths opportunities to combat what really threatens the U.S.
Education is an issue of national security. And the greatest threat is internal. Although different from Jim Crow segregation, the impact of racism and sexism today on life outcomes is no less strong. In lieu of starting a war to produce more black female mathematicians, let’s just ask them how it’s done. In her examinations of high-achieving black women in physics, Fries-Britt found that as girls, they’d had “significant precollege exposure to science.” The black women in Fries-Britt’s studies participated in science competitions, went to science museums and had family members who introduced them to STEM fields. Clearly, giving kids exposure early and often is key to creating mathematicians and scientists. Like the women of Hidden Figures, high-achieving black students in the sciences are well aware of the stereotypes that brand them incapable. And like their predecessors, many students are driven by these perceptions. Fries-Britt describes this as a “proving process,” an incessant need to do well and to prove that they are capable. “She will undoubtedly face many people who believe she is not good enough and can’t do the work,” said Jackson of a black female student who excels in the sciences. “However, if she has parents, friends, teachers and mentors that truly support her, she will not believe those naysayers.” Jackson emphasized the importance of a support group. Black parents are rearing math and science whizzes in spite of negative societal expectations that allow most youths’ math talents to languish in misplaced professions. It’s the expectations of schools, employers and universities that fail us. This is why young black girls must find the joy in math. The world around them is hard enough. “Help her to see the fun in math. Math is very challenging, but there is a beautiful side to it that makes it all worthwhile,” said Jackson, exemplifying the spirit that brought Hidden Figures to the screen. Black female mathematicians’ mindsets and persistence can’t be measured on a test, but their performances in the face of barriers—that we create—merit resources and opportunity. The greatest gift of Hidden Figures will certainly be awareness. It’s to be hoped that this translates into opportunity.